One of Nigeria’s most remembered leaders, 37-year-old Murtala Muhammed, was killed on February 13, 39 years ago, in an abortive coup attempt led by Lt. Col Buka Suka Dimka. Many years have passed, but the nation still remembers its great leader. 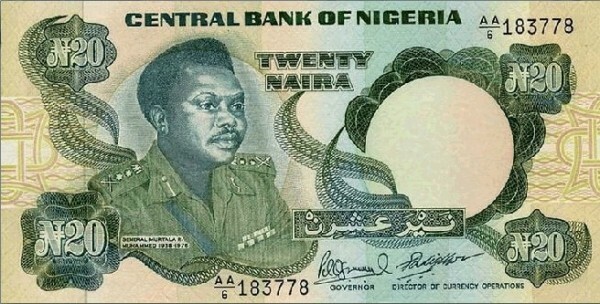 For many Nigerians, getting to know Murtala Mohammed was from the green, crispy N20 naira note, which had its face inscribed on it, and really clear-headed stories told by parents. We gathered for some must-know facts you need to know about hero of Nigeria’s nation. Born on a Tuesday, the 8th of November, 1938, in the Kurawa Quarters of Kano State to Risqua Muhammed and Uwani Ramatu, he had 7 siblings (one girl and seven boys) and he was the second child. On the 26th January, 1952, he was admitted as student number 941 as the school itself was founded in 1909. He was one of the ten students from Kano and finished in 1957. One of his classmates was the late General Mohammed Shuwa shot dead at his home by gunmen in Maiduguri in November 2012. Shuwa was one of the prominent figures during the Nigerian Civil War and later a leading figure in Murtala’s government. Gowon also attended the same college. He attended Regular Officers Special Training School , ROSTS (Teshie, Ghana), now Ghana Military Academy where he was taught as a 2nd Lieutenant infantry tactics and military laws by the late Odumegwu Ojukwu. Obasanjo and Gowon also attended ROSTS. He was introduced to his wife by his cousin. They fell in love, hit it off, and when they met in Kaduna later, he proposed to her and they got married in Kaduna in 1963 after her studies, the same year he became a Captain. Their marriage was a blissful and peaceful one. In 1965, the marriage was blessed with a cheeky baby girl who later attended the Queen’s College, Yaba, Lagos. At the time when Murtala was killed, his daughter, Zalihatu was just two years old, and Jumai was just a baby. When Murtala was killed and the news was relayed to his wife, she broke down and wept for her dear husband. Today, Mrs. Ajoke Muhammed is ageing gracefully, is widely respected for her charitable activities and calm demeanor. Even as a First Lady, she was not unnecessarily flamboyant. Her marriage was blessed with six children: Aishat, Fatimah, Zakari, Risqua Abba, Zalihatu, Jumai (she was just a baby, less than a year old when her father was killed). The daughters are now married. By the end of 1964, Murtala was already a temporary Major (known as a T/Major). The Nigerian Civil War (1967-1970) lasted for thirty blood-soaked months and one of the principal actors of that sad phase of Nigerian history was Murtala. He set up a panel headed by Justice Ayo Irikefe on the creation of seven more states (Niger, Bauchi, Gongola, Benue, Ogun, Imo and Bendel) to the existing ones on 22nd December, 1975. The panel came up with a report which was utilized in the formation of new states in 1976. Murtala was a blunt, outspoken and consummate risk taker. A soldier who ironically had no regard for the chain of command, he was in a class of his own when it came to dangerous exploits. A no-nonsense person, Murtala was known for his legendary outbursts of terrifying anger. Read ALSO: Interesting: Checkout The 36 States Of Nigeria And Their Meanings.